What does the word Mycorrhizae Mean? “Mycor” is the Latin word for ‘fungus’, and “rhizae” means “roots”. So, the term Mycorrhizae perfectly describes the mutually beneficial relationship between a plant and the specialized fungi that support its roots in healthy, undisturbed soil ecology. Both the plant host and the fungi benefit in this unique relationship. It is the classic example of a mutually beneficial symbiosis between 2 very dissimilar organisms. So to be clear, the word Mycorrhiza is not the name of a specific genus or species of fungi (in the way that the word ‘Acer’ is applied to all Maples) but rather mycorrhiza is a descriptive term for this unique type of fungi. 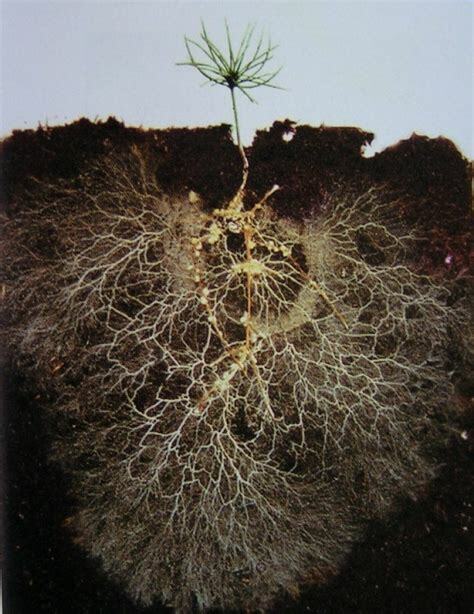 And mirroring the great diversity of plant species that we see above the ground, there are hundreds of species of mycorrhizal fungi associated with plant roots below the ground in undisturbed natural landscapes. Fossil evidence and DNA sequence analysis] suggest that this mutualism appeared 400-460 million years ago, when the first plants were colonizing land. 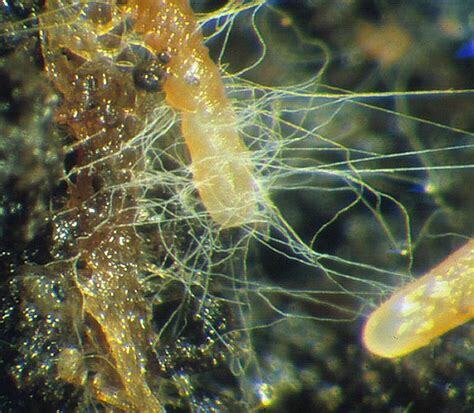 How do Mycorrhizal Fungi Help Roots? Nature has perfected a highly-efficient, closed-loop system. The application of synthetic fertilizers essentially short-circuits this process; plants suddenly find their roots saturated with highly plant-available, reactive nutrients – and as a result – they simply stop ‘asking for help’ from soil microbes like mycorrhizae. The upshot of the sustained application of high-potency synthetic fertilizers is a steady decline in soil microbial life – soils simply become ’empty media’ lacking in all but foraging bacteria and latent pathogens. Lady Eve Balfour (1898 – 1990) is best known as the founder of The Soil Association, Britain’s leading organic food and farming organisation. 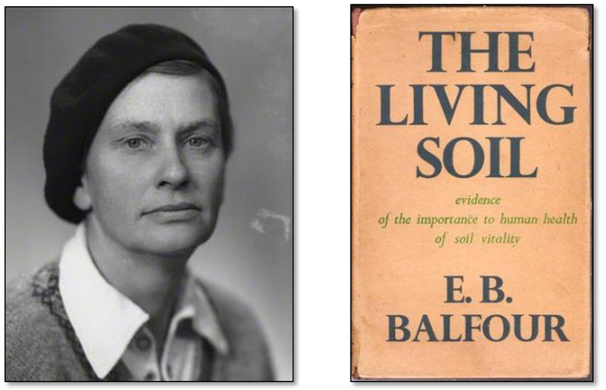 The Soil Association was born in 1946, following publication of Lady Eve Balfour’s bestselling book about organic agriculture, The Living Soil (Faber & Faber 1943). Born into one of Britain’s most important political families, the Balfours of Whittingehame, East Lothian, Eve Balfour decided at a young age that she wanted to become a farmer. She trained at Reading University College during the First World War and after briefly managing a hill farm in Wales, Eve and her sister Mary bought a farm in Suffolk. 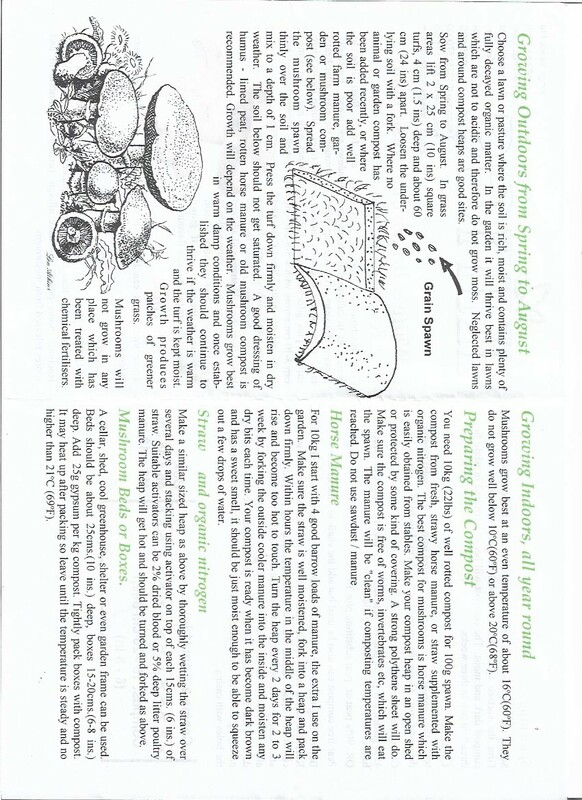 Eve Balfour was a pioneer who introduced the world to the essential function of soil fungi showing how they can expand the root zone of plants by many 100’s of times and to build associations with the complex web of microbes that maintain the long term fertility of plants and soil. It was her ground breaking work that started to reveal that this complex web of connections is the basis of soil health and fertility. Her research helped create the organic farming movement. 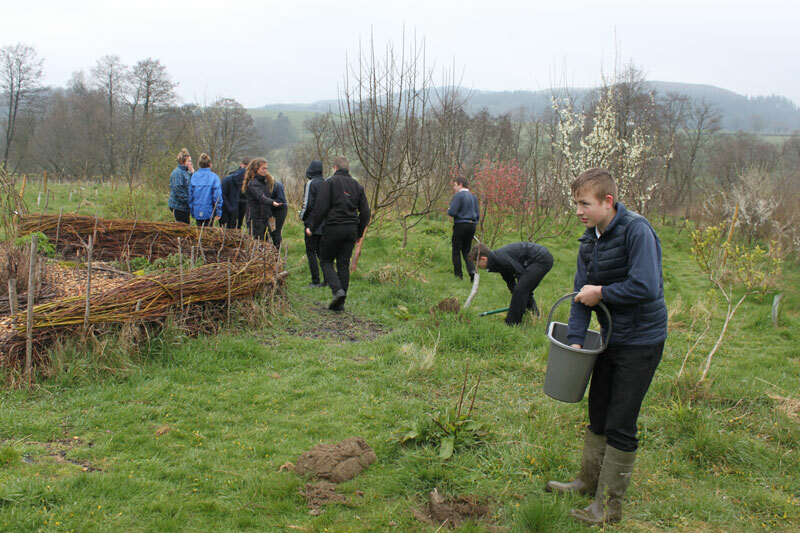 Ploughing the soil and using fertilizers and herbicides disrupts fungi from functioning, so we have decided to seed the orchard and meadow with field mushrooms to remedy this and kick-start a more connected ecology. We aim to gain another yield from the system, in terms of edible mushrooms and to help restore a much higher level of fugal activity in the soils; this will have a broad beneficial impact on the whole food forest system. We ordered white cap, field mushroom spawn from Kings Seeds and it came in a form of wheat grains, fuzzy and white with mushroom spawn. 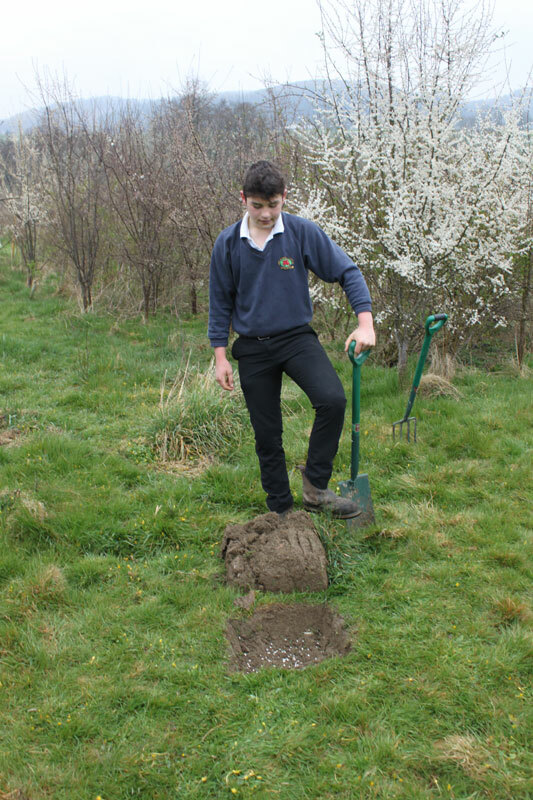 These can be seeded just beneath the turf in the field, we added some well rotted manure to some of the holes to help their growth also. The packet advised us to keep it cool and use by early May. The body of fungi is really the mass of mycelium, part you often dont see, the cap is the simply the fruiting body, allowing it to distribute its spores. Many types dont produce mushrooms at all, even though that is what we mainly know them by. Some fungi are symbiotic organisms, meaning they live in a mutually beneficial relationship with plants, with whom they exchange minerals for sugar. These specialist root fungi, or mycorrhizae being a good example. Some are parasites, meaning they act like a disease, drawing energy from a host species but most are saprophytes, which means they live off dead materials. Fungi live at the interface between life and death, they break down dead matter and convert it into nutrients in a form that new life can access it, they are the basic habitat building organism. A primary saprophyte generally breaks down recently dead matter like trees, leaves, manure and other available forms of organic carbon. Followed by secondary saprophytes that break down the debris left behind by the primary ones. This type are often hard to cultivate as they are very choosy about that they substrate, or food substance they will grow in. Following them come the elusive tertiary saprophytes, who some ecologists believe are very important organisms indeed. These mop what ever is left over and prevent any long term loss of nutrient in an ecosystem. Maybe even more importantly it seems they can select for certain microbial species and create the conditions that new life can begin again in. The kind of living systems that in the long term again generate the right conditions for these choosy organisms. There is much still unknown about this complex world beneath the soil, but much evidence of just how important it all is.